Each October, fireballs appear to emerge from the Mekong River in Nong Khai, Thailand. Also known as the Mekong Lights, or "bung fai paya nak," legend has it that the Naga Fireballs are spat by a river monster from Buddhist lore. Some "explanations" include swamp gas and tracer rounds fired by soldiers on opposing banks, but swamp gas (methane) can apparently be ruled-out. 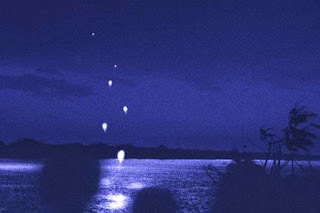 While soldiers do fire tracer rounds and fireworks (apparently for tourism, as the Mekong Lights are sparse some years), many films and photos appear to show the Naga Fireballs emerging from the water. One study by a Thai science institution claimed the Mekong Lights are actually isoprene. The OddBlog is dedicated to all things paranormal, Supernatural, odd, and Unexplained. From Cryptozoology to the Supernatural to Ufology, and all points between, The OddBlog discusses the Unknown and Unexplained - ghosts and hauntings, UFO and Bigfoot sightings, lake monsters, psychic/ESP phenomena, paranormal research, conspiracies, and anomalies - balanced with a healthy dose of "accepted" science and news.